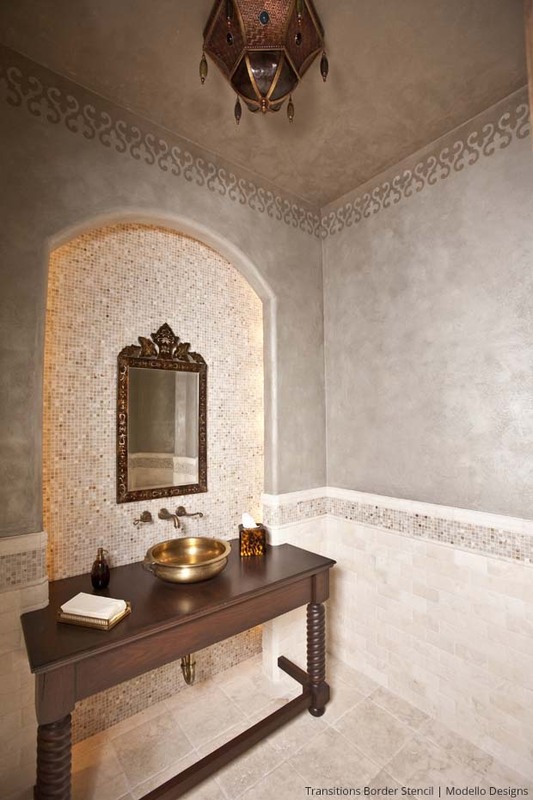 Our monthly Stencil Star series showcases our customer’s use of our Royal Design Studio mylar wall stencils and Modello® custom vinyl stencils on walls, ceilings, floors and more. This week, we feature the sophisticated stencil artistry of the incredibly talented Janie Ellis of Anything but Plain. 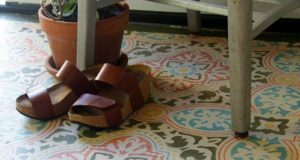 She directs her talented team to take the application of stenciled pattern to new creative heights in virtually every one of her decorative painting projects. 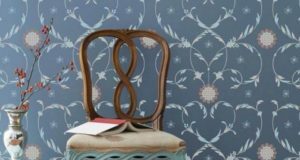 Showcasing the versatility of stencils, Janie takes the Large Moorish Trellis Stencil and modifies the pattern for an artistic and unique allover wallpaper look. 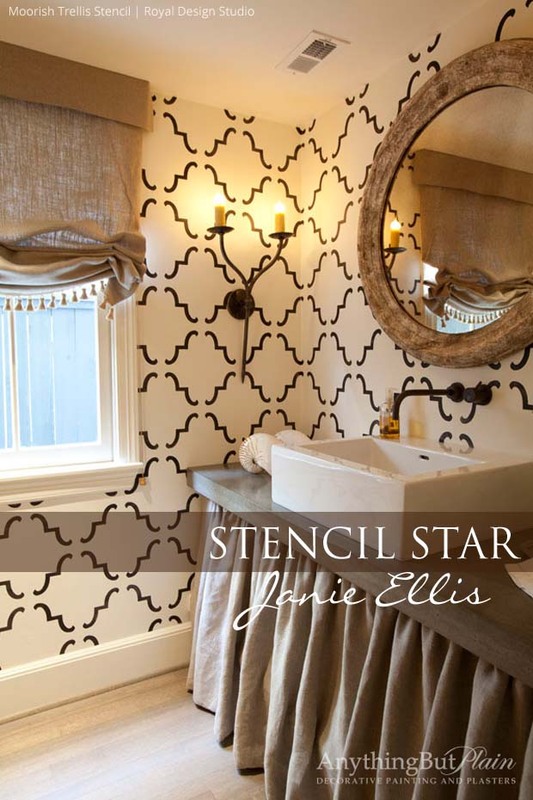 MEET STENCIL STAR JANIE ELLIS. Certified Master Artisan and Owner of Anything But Plain, Janie Ellis launched her business in 1989 with a creative approach to decorative painting. With a BA in Art, a Master’s Degree in Interior Design and years of experience, Anything But Plain is a forerunner of the decorative painting industry. It has consistently garnered many awards and earned a reputation of excellence! 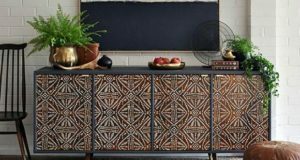 Their repertoire of stunning, award-winning finishes ranges from dimensional layering of artisan textures and hand-painted murals, to extraordinary cabinet and furniture finishes. Janie’s work has been featured on television, in books as well as in national publications. 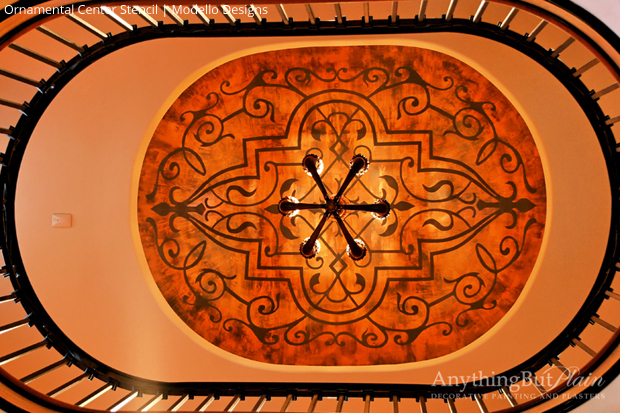 The Large Marrakesh Trellis Stencil from the Allover Moroccan Stencils Collection graces the insets of a coffered ceiling in a beautiful and striking color combination. We caught up with Jane to learn more about her business and working style. Let’s take a look at what this stencil star had to say! How does stenciling enhance your creative business? Since my background was in fine arts, I hand painted all my designs when I first started my business. This was fine until I hired my first employee. Not every artist has the same skill sets. With two or three people working on the same design, we would lose uniformity. Using stencils allowed artists of different skill levels to perform at the highest degree and create the consistency that we needed. When we started to create more all over patterns and damask designs, the stencil was the only way to go! 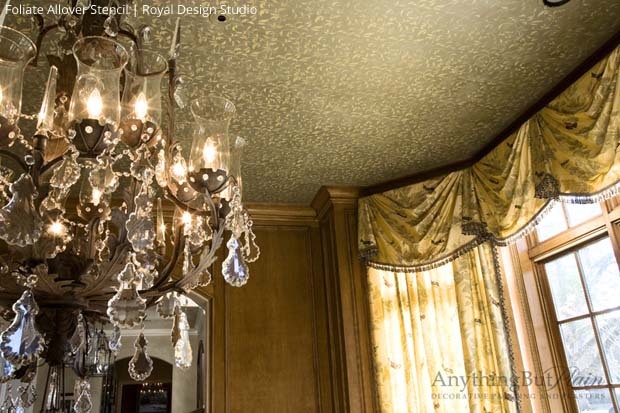 A Foliate Allover Stencil (FolAll150) from Modello® Designs add a beautiful pattern to a traditional ceiling. All you need is a little lace! 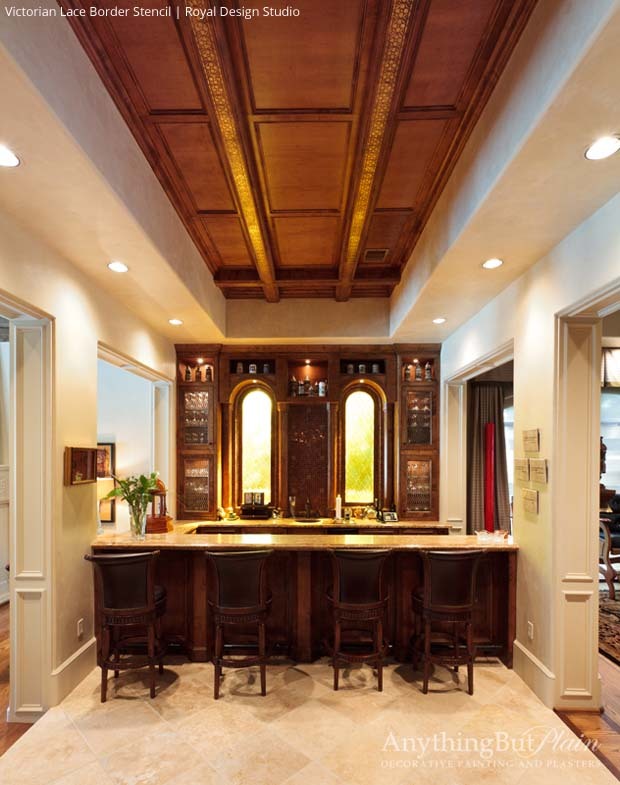 The Victorian Lace Border Stencil with a gilded effect makes the perfect pattern addition to a bar’s paneled wood ceiling. How do you determine which pattern works for you? Thank goodness we have so many patterns to choose from! I know styles and different periods of furniture so that information is my guiding source. You don’t have to stick rigidly to the rules of design, but it makes the choosing simple. Since I work almost exclusively with designers it becomes a collaborative effort and a whole lot more fun! 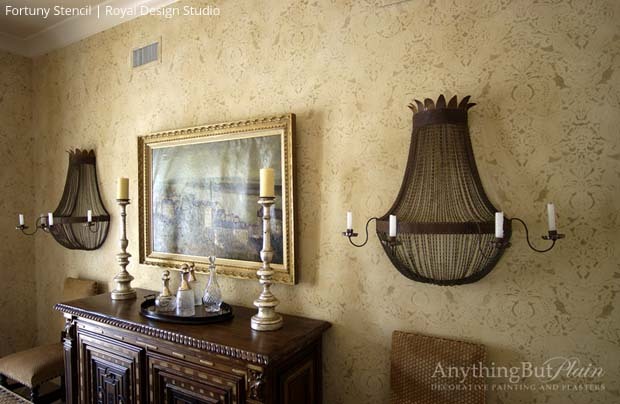 Adding drama and interest to otherwise boring walls, a Transitions Border Stencil (TransBor106) from Modello® Designs stuns in this artistic, luxe home. What are some of your best Stenciling Tips? If we are using an allover pattern, such as a damask, we use a sharpie to draw a vertical and a horizontal line that runs through the center of the design. We make sure they are level. Then when we place the design on the wall we just hold the level next to the line to see if we are staying on track. If we are creating a random design we use the insert from stencil package and create black and white copies. Taping the black and white copies around the room gives you the freedom to change your layout before you get too far into the project. If you are working with another person, it allows them to continue placing stencils ahead of you because they already know where they should go. It makes the job go quicker. Reminiscent of the famed Fortuny silks from Italy, Janie used the Fortuny Damask Wall Stencil from the Allover Damask Stencils Collection creates a gorgeous fabric wall finish. Everyone who enters this space has an incredible reason to look UP! A modified Ornamental Center Stencil (OrnCen186) from Modello® Designs Medallion Stencils Collection was used by Janie and her team to create an impactful patterned ceiling. 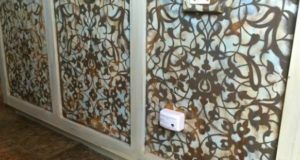 As you can see from Janie’s decorative finishing projects, using a stencil adds incredible detail and interest to a space. Imagine each without the stencil pattern! We are so happy she took the time to chat with us and provide a few great pro tips as well. Please be sure to stop by Anything but Plain to see even more of her painterly, sophisticated works. We hope you have enjoyed taking a look at the works of the very talented Janel Ellis, our stencil star of the month! Be sure to give us a shout out if you are working on any stenciling projects of your own at projects@royaldesignstudio.com. Looking for a stencil/rubbing that can be put on a server that has oriental handles, something with an Asian design for the doors. Can you help me? This is a very fine piece of furniture and I don’t want to ruin it. 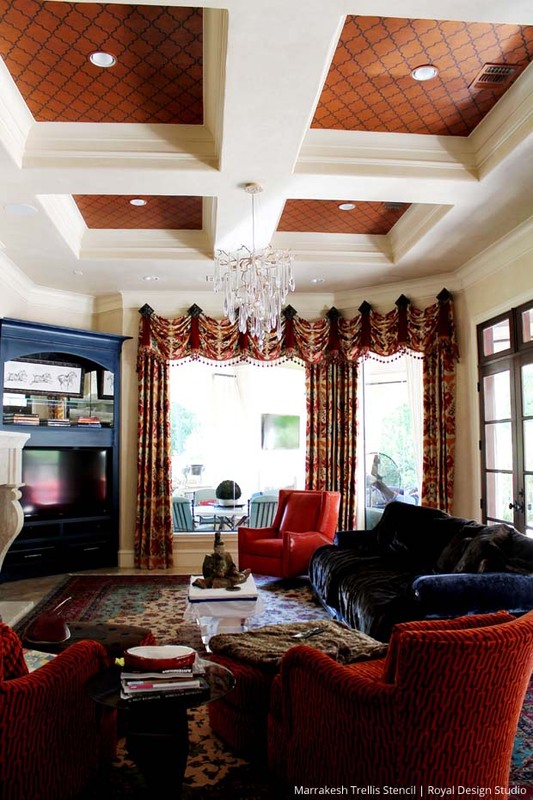 I am so impressed with beautifully decorated ceilings and walls there way out of my league but love them anyway. Heplo there! I know this is kind of offtopic but I was wondering if you knew where I couild get a captcha pugin for my comment form?I’m using the same blog platform as yours and I’m having trouble finding one?Thhanks a lot! This article wikll help the internet viewers for creating new website or even ablog from start to end.